Electronic cat feeders are great devices that are serve food to your cat at preset times, scheduled by you. They have many benefits. The most famous benefit is the ability to “forget” about feeding your cat. Set it up and that’s all, besides filling it up and supervising its normal functioning. 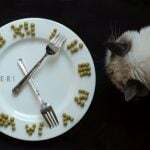 You are able to schedule your cat’s meals for the same time each day. You can stop your cat from begging for food. All animals have well set biological clocks. 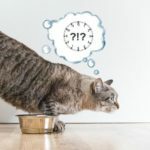 Many owners, who feed their cats at the same time every day, will confirm this: if a cat starts purring near them or is tangling between their legs, there’s no need to look at the clock; it will show no more than ten minutes before or after the specific feeding time. Okay, it is usually before and rarely after. The inner clock of cats is THAT precise. Cats love predictability, and food is very important. For example, if you get your paycheck at the same time every month, you do not worry, even if your wallet is almost empty a few days prior to payday. However, if you suspect that your check might be late this month and you are not sure if it will be a day or a week… Oh my god! In the same manner, a cat who is used to food being served at 10 am by a machine will still be calm at 9:30 am, even though his stomach is empty. One of our favorite parts about automated cat feeders, though, is that it stops cats from begging for food. How often have you been awakened by your cat a good hour before the alarm goes off? It’s hard to blame your cat; he wants to eat and knows who’s in charge of that magical appearance of food. Get it? In order to get the food, your cat must wake you up! But what if the food were distributed to your cat by an automatic machine? The association between you and the source of the food will soon disappear. Maybe your cat will start waking up the automatic feeder instead! Well, of course, not. First, an automatic feeder never gives in and feeds your cat earlier just because he meowed louder; thus, there is no way for a cat to learn to do it. Second, even if your cat does purr around the feeder, it’s not your problem. Meanwhile, if your cat has sleeping problems, you might want to check our guide to stop your cat from waking you up at night. Will your cat love his electronic feeder more than he does you? “Wait a minute,” you might think. “If a cat will stop seeing me as the food supplier, he will stop respecting me.” Well, there is a small amount of truth to that. An 1989 experiment by Swiss Zoologist Karin Geering demonstrated that cats do indeed love a person who feeds them. 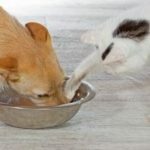 At the same time, Geering found that love built on food supplier status was not as long lasting as “true love” created through other bonding activities, such as petting, talking, and playing with your cat. This means, feeding your cat will not guarantee he will love you. You may as well pass this activity to a “machine,” but implement more playing, grooming, and petting into your relationship with him. 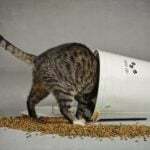 The biggest limitations of automatic cat feeders is that most of them operate with dry food only. This isn’t much of a problem for most cat owners, and the selection of automated feeders is wide. 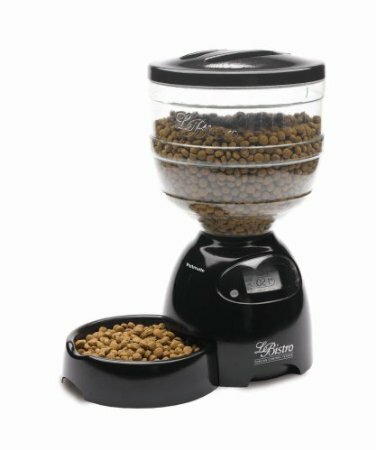 For those who prefer canned or raw food for their cats, some automatic feeders, like this one from “Cat Mate,” do house ice packets to keep the food fresh. However, it can’t guarantee freshness for more than 12 to 24 hours. 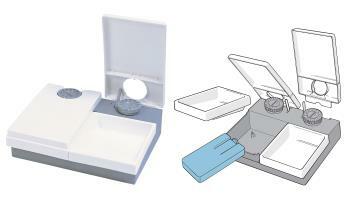 Thus, you will need to fill it up twice a day, but you will still get the other benefits of automated feeding described above.